Difference between revisions of "Unreal Engine overview"
The Unreal Engine is a video game development engine created by Epic Games in 1998. It was originally developed for the game Unreal, which is where the engine gets it's name. Nowadays, the Unreal Engine is not only used by Epic Games, but by many licensees to create 3D games for PC (Windows and Linux), Macintosh and various other console platforms such as Xbox 360 and PS3. The Unreal Engine is free to anyone and can be used to create a variety of games and on any platform. 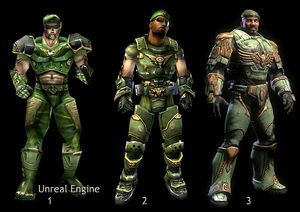 Since the Unreal Engines debut in 1998, there have been three major generations of the engine. Each generation features more developing mechanics and utilities than the previous, the current generation of the Unreal Engine is Unreal Engine 4. The original Unreal Engine debuted as the back-end for the 1998 first person shooter Unreal. The Unreal Engine later found it's place as the engine for other games such as Unreal Tournament, Deus Ex, Wheel of Time, Klingon Honor Guard and others. The second generation of the Unreal Engine powered games such as Unreal 2, UT2003, UT2004, Unreal Championship 1 and 2, XIII and others. Major new features not present in the original engine include hardware meshes (aka. StaticMeshes), fluid surfaces, terrain support, complex materials, particle emitters, volumes, and more. A default version of the Unreal Engine 2 can be freely downloaded as the Unreal Engine 2 Runtime, which is based on the UT2003 state of the engine. A special version, Unreal Engine 2.X, was optimized for the Xbox console and used for Unreal Championship 2. The state of the engine based on UT2004 is known as Unreal Engine 2.5. The third generation of the Unreal Engine is one of the most popular versions, being widely used on PC, PS3 and Xbox 360 games. Unreal Tournament 3, for example, is available on all three platforms. Other Unreal Engine 3 games include Gears of War 1 and 2, Mass Effect, America's Army 3.0 and many others. Many new features have been implemented since Unreal Engine 2, such as level streaming, Kismet scripting, as well as complex material and particle editors. Also, as part of the Integrated Partners Program licensees can select from many third-party components to integrate into their games. Not much is known about the upcoming fourth generation Unreal Engine, except that Tim Sweeney and maybe a few other people are working on it. Unreal Engine 4 is supposed to target the next generation of consoles. Last modified at 12:38, 30 April 2017.